Rating: 4/5 stars Highly recommended for a quick play around. An unbelievable game for 1 hour a of work a day. No doubt this game will continually improve. Play it now whilst you can still get on the high score pages! The aim of the game is simple: drive your way to the finish line whilst outrunning your opponents and avoid crashing into the public cars. At this point I would like to point out that usually most 3D games like this are developed by teams of coding houses. But here the one indie developer (& family man) has managed to churn out this full 3D game using a scarce 1 hour of work a day. That either means he’s an awesome developer or he’s spent many days coding – either way it’s a great outcome for his product. 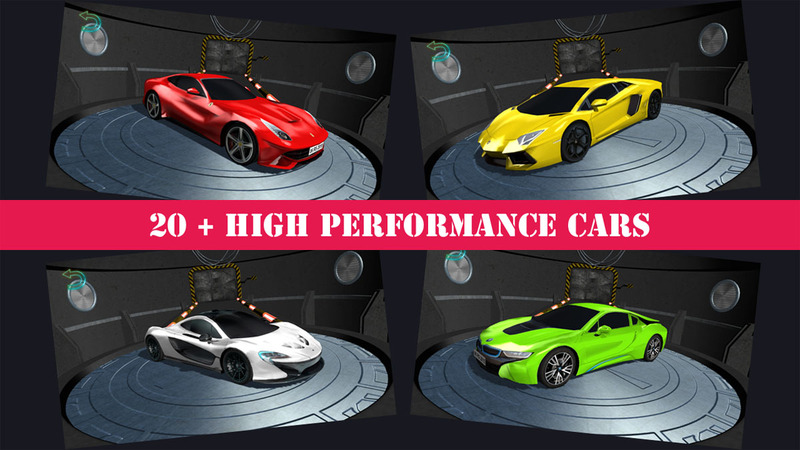 The game is continually being improved and currently it has Quick Race,Career, Online and Endless Racing options. 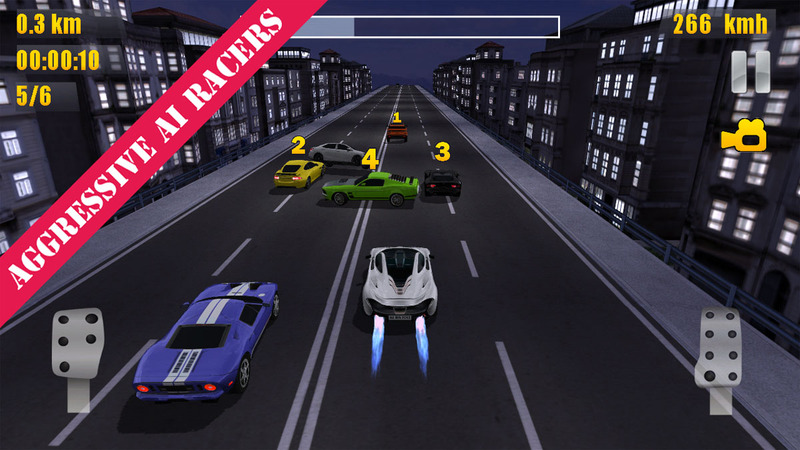 Quick Race and Career are short races against 5 other AI opponents; Online is playing against other real players; Endless racing is where you have to reach the check point before the countdown timer reaches zero. Personally I quite like the Endless option because it reminds me of OutRun. Classic Nitro madness from Need for Speed / Fast and Furious has happened here and so all the cars have been kitted out with Nitros…. It’s a good thing too because it makes the game much more fun. They also happen to be Dual nitros so you can double boost whilst you’re driving. Interestingly the nitro auto charges as you’re driving or it is charged up by special actions: driving-by close to other cars (i.e. near misses), and perfect drives (i.e. you don’t crash). If you do happen to crash the car then you’ll relive the wrecking feeling from Destruction Derby. As usual there is more to the game than just driving the tracks – after each round you’re awarded money for the quality and bravery of your drive (and you’re rewarded more for online driving). The money can then be used upgrade your existing car or for buying a new cars – there are several top quality race cars. Just a word of warning – don’t be too trigger happy with the upgrades because there’s no going back after you’d improved a car! Rating: 4/5 stars Highly recommended for a quick play around. An unbelievable game for 1 hour of work a day. No doubt this game will continually improve. Play it now whilst you can still get on the high score pages! The optimum money spend technique would be to aim to buy the better car over upgrades where possible. It is possible to win first place in races using the provided stock car. If you’re finding this hard to handle then I would suggest investing money into the handling. Then don’t spend any more until you save up for the car you want. Think about the driving line to optimize your route and to reduce the amount you need to turn. The Nitro is more beneficial when you have reached your top speed rather than being used for when you have crashed and you’re accelerating from zero. Use the Nitro in bursts on the straights. Drive near public cars to get near misses which will boost your Nitro. Make sure to use your Nitro regularly or you will not be optimising your speed. If you have a old phone which is bad for touch control then consider using the tilt to steer function. Or if D-pad is still preferred press the accelerator right at the tip of the pedal so you’re not horizontally aligned with the steering buttons.